I am originally from Albacete (Spain) but I got my Bachelor Degree in Biology at Universidad Autónoma in Madrid. 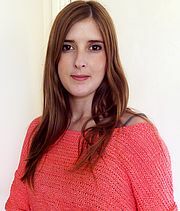 I am currently working on my PhD at the Biochemistry Department of University College Cork in Ireland. My work, supervised by Professor Thomas Cotter, is focused in the treatment of Retinitis Pigmentosa using a progesterone analogue called Norgestrel. Retinitis pigmentosa (RP) is a group of hereditary retinal diseases, characterised by photoreceptor cell loss. Despite a substantial understanding of the mechanisms leading to cell death, an effective therapeutic strategy is sought. Our laboratory has previously demonstrated the neuroprotective properties of Norgestrel in the degenerating retina, mediated in part by the neurotrophic factor basic fibroblast growth factor (bFGF) (Wyse Jackson & Cotter, 2016). 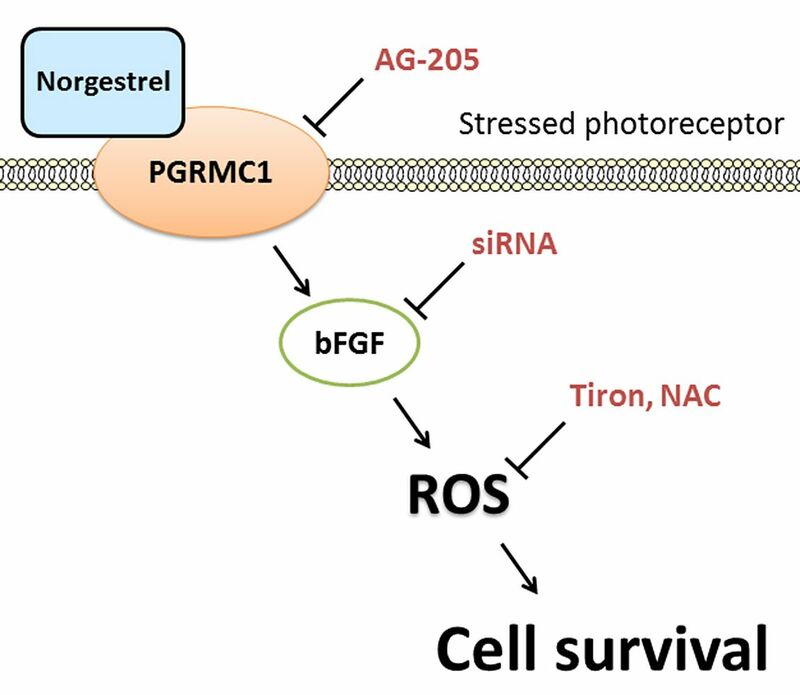 In other retinal studies, we have also presented a pro-survival role for reactive oxygen species (ROS), downstream of bFGF (Farrell et al., 2011). ROS are constantly being generated under normal conditions in aerobic respiration and for many years, they were described simply as destructive by-products of the process. In recent years, however, our understanding of these molecules has changed and they are no longer associated solely with damage. It has become increasingly clear that ROS signalling is also involved in pro-survival mechanisms (Rhee, 2006). Therefore, in light of the above studies, we sought to understand the role that ROS play in the Norgestrel-mediated response. By means of flow cytometry analyses, Norgestrel significantly increased ROS levels at 30 min following serum-starvation in the 661W photoreceptor cell line (Figure 1A). Norgestrel enhanced cell survival at all time points studied (Figure 1B), suggesting that ROS production is linked to an increase in cell survival. In order to test this hypothesis, the antioxidants Tiron and NAC were used to block the increase in ROS, showing Norgestrel was no longer protective in the presence of the antioxidants compared with the vehicle only (Figure 1C). Figure 1. 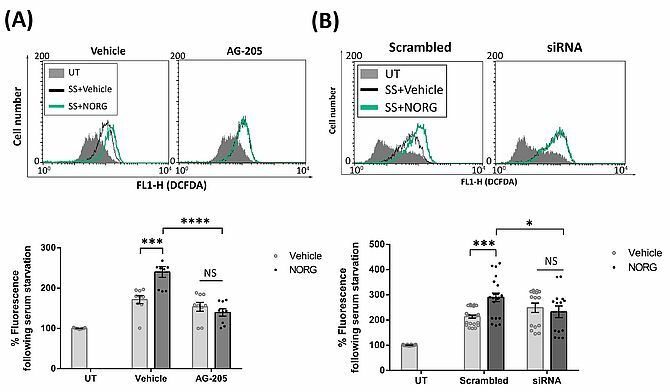 (A) FACS analysis of 661W cells treated with 20 µM Norgestrel or vehicle control (DMSO) following SS. 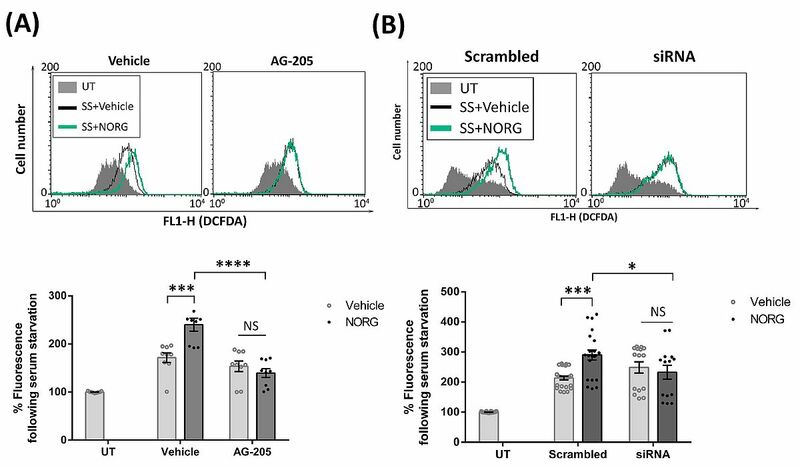 (B) MTS assay showed Norgestrel enhanced cell survival in all time points studied compared with the vehicle control. (C) Norgestrel was no longer protective in the presence of antioxidans. Previous studies have shown that PGRMC1, a membrane-localised progesterone receptor, is responsible for the neuroprotective actions of Norgestrel (Wyse Jackson et al., 2016) as well as the bFGF up-regultation. Therefore, both the specific PGRMC1 inhibitor, AG-205 (Figure 2A), and bFGF siRNA (Figure 2B) were used to block them in stressed 661W. 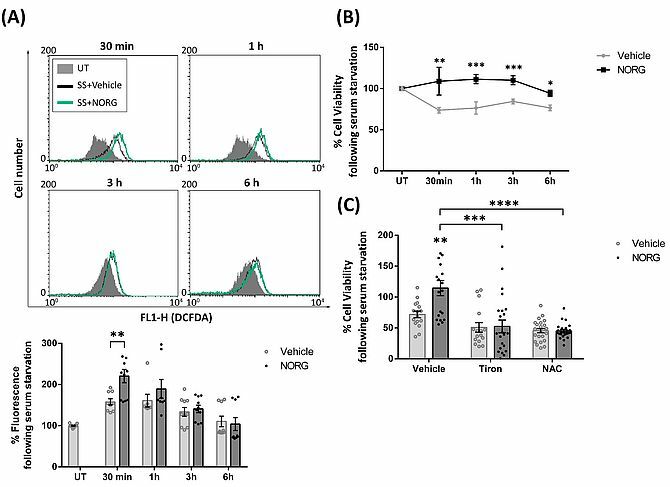 The burst of ROS produced by Norgestrel was abrogated when both were inhibited as detected by decreased DCFDA fluorescence intensity, suggesting that this response is PGRMC1 and bFGF-dependent (Figure 2). 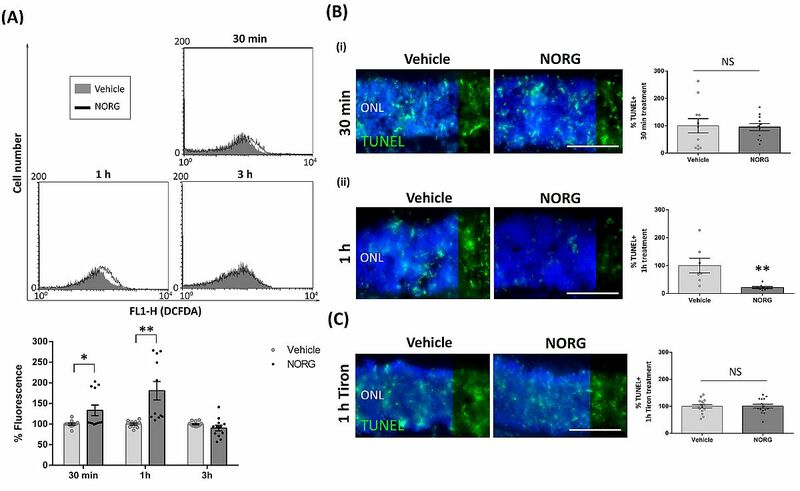 Results from this study thus far demonstrate that Norgestrel, through bFGF, utilises ROS signalling to promote neuronal survival of the 661W cell line. We subsequently evaluated the effects of Norgestrel on P15 rd10 retinas, a suitable timepoint as photoreceptors have initiated cell death mechanisms but photoreceptor loss is not yet apparent (Roche et al., 2016). The population of photoreceptors from rd10 retinas treated with Norgestrel showed an increase in ROS production compared to those treated with vehicle control, at 30 min and 1 h (Figure 3A). Interestingly, Norgestrel-mediated reduction in photoreceptor cell death was only evident at 1 h, as assessed by the TUNEL assay (Figure 3B). In order to determine if this increase in photoreceptor ROS is necessary for Norgestrel-mediated protection in rd10 explants, we utilised the antioxidant Tiron. Norgestrel could no longer protect rd10 explants from photoreceptor cell death over 1 h, when ROS production was inhibited through Tiron antioxidant (Figure 3C). This supports our findings in 661Ws that Norgestrel initiates a pro-survival burst of ROS, assisting in the survival of retinal photoreceptor cells. Figure 3. (A) Norgestrel up-regulated ROS levels at 30 min and up to 1 h in rd10 retinas. (B) Norgestrel reduced TUNEL-positive staining in the central rd10 retina after 1 h treatment, but not at 30 min compared with the vehicle control. (C) Norgestrel was not able to reduce TUNEL-positive staining after 1 h treatment in the presence of Tiron. Scale bar 50 µm. In summary, this study presents an important aspect to Norgestrel’s neuroprotective properties, up-regulating ROS production as an immediate response, through the activation of PGRMC1 and increased production of bFGF (Figure 4) (Ruiz Lopez et al., 2017). Farrell, S.M.J., Groeger, G., Bhatt, L., Finnegan, S., O’Brien, C.J., & Cotter, T.G. (2011) bFGF-mediated redox activation of the PI3K/Akt pathway in retinal photoreceptor cells. Eur. J. Neurosci., 33, 632–641. Rhee, S.G. (2006) H2O2, a Necessary Evil for Cell Signaling. Science (80-. )., 312, 1882–1883. Roche, S.L., Wyse-Jackson, A.C., Byrne, A.M., Ruiz-Lopez, A.M., & Cotter, T.G. (2016) Alterations to retinal architecture prior to photoreceptor loss in a mouse model of retinitis pigmentosa. Int. J. Dev. Biol., 60, 127–139. Ruiz Lopez, A.M., Roche, S.L., Wyse Jackson, A.C., Moloney, J.N., Byrne, A.M., & Cotter, T.G. (2017) Pro-survival redox signalling in progesterone-mediated retinal neuroprotection. Eur. J. Neurosci., 1, 1–10. Wyse Jackson, A.C. & Cotter, T.G. (2016) The synthetic progesterone “Norgestrel” is neuroprotective in stressed photoreceptor-like cells and retinal explants, mediating its effects via basic fibroblast growth factor, protein kinase A and glycogen synthase kinase 3β signalling. Eur. J. Neurosci., 43, 128–139. Wyse Jackson, A.C., Roche, S.L., Byrne, A.M., Ruiz-Lopez, A.M., & Cotter, T.G. (2016) Progesterone receptor signalling in retinal photoreceptor neuroprotection. J. Neurochem., 136, 63–77.